We want all of our clients to live their best life in retirement – that's why we develop a tailored, comprehensive roadmap to help get you there. And making the shift to retirement is a big change that can feel overwhelming so we we make sure we are here for you every step of the way. Whether you're preparing to retire or ready to enjoy your retirement, we're here ready for you with the solutions you need. Check out some of our Retire Ready resources below or reach out to find out more. Retirement is Coming - How much will you spend? 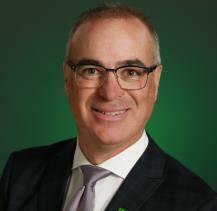 Hickey And Svalina Family Wealth Management is a part of TD Wealth Private Investment Advice, a division of TD Waterhouse Canada Inc. which is a subsidiary of The Toronto-Dominion Bank. A local to the Northern Ontario Region, I am passionate about helping my clients achieve their vision of success. My 20 years of dedication and success in the financial industry has been recognized by TD Wealth through a variety of awards - President's Club*, MERIT* and Executive Club*. In addition to providing sophisticated wealth solutions for my clients, I also manage a team of advisors in Sudbury. Outside of the office you will find me with my family. My wife and I are often found trying to keep up with our children's competitive sports schedule - hockey and jujitsu. Where we can fit it in, we enjoy golfing, travelling and afternoons spent on the lake boating and wake boarding. *President's Club is awarded to individuals for meeting or exceeding business financial goals as well as maintaining a high level of professional business conduct throughout the year and consistently demonstrating integrity and the highest ethical standards. *MERIT is awarded to sales employees who meet or exceed their business unit's criteria, consistently deliver legendary experiences and demonstrate the following qualities: motivation, excellence, results, integrity and teamwork. *Executive Club is awarded to individuals for meeting or exceeding a specific financial milestone.